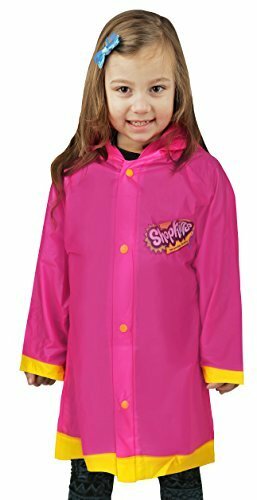 These Shopkins character rain Slicker are as cool as it gets. Your little one will love this fun and cute way to stay dry. The hood and snap closures keep the rain out. The graphic character prints keep the fun going. You wont go wrong! ★ WATERPROOF - The thin but durable 100% vinyl rain slicker is strong and resistant to water and humidity. Excellent good protector for children outdoor in rainy days, includes a hood for extra protection. ★ SIMPLE SNAP CLOSURE - Convenient snap closures with brightly colored snaps are easy to spot, fasten and unfasten, so kids can quickly and easily change in and out of their rain slicker on their own. ★ Easy-Clean Materials - To clean - simply wipe down with a damp cloth as needed. ★ LIGHTWEIGHT & COMFORTABLE - The thin lightweight slicker fits easily over his or her clothing to keep your child comfortable in the rain. If you have any questions about this product by Shopkins, contact us by completing and submitting the form below. If you are looking for a specif part number, please include it with your message.